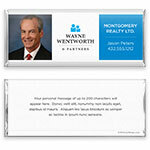 Incorporating a photo, your logo, and space for branding or your personalized message, this candy wrapper is suited to a variety of corporate events. Design: Block layout with photo, logo and text squares. Personalization: Photo on the front with a logo and information, message on the back.